Tracking your college expenses is a great way to prepare for life after school. This convenient and free template can help you monitor every cent you spend and provide you with the perfect way to start saving. By analyzing the data that this template gives you, you will be able to make changes in your spending behavior and master your budget, even before you finish school. Having great budgeting skills is something that will take you far in life and this free template is here to help. If you’re interested in saving money in college, download this free budget tracker today. To download this free College Student Expense Tracker document, just scroll to the bottom of this page and click the link we have provided for you. Next, you’ll need to customize the template to fit your daily expenses perfectly. Take a look at the examples already given to you in the College Student Expense Tracker. If there are any items that don’t apply to you in any way, just delete them or change them to other expenses by clicking the cell and entering something new. Start by entering the starting balance of your tuition (what you currently owe) and then proceed to any income that you may have in the table below. 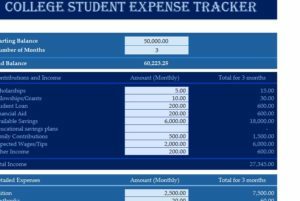 When you are finished entering your income and expenses, proceed to the “College Student” tab at the bottom of your screen. This tab is to help you monitor, in-depth, how much you spend monthly on your expenses. Go through the list and budget yourself, on a monthly basis, by entering in your budget for that particular month. You can see how easy it is to save money over time by using this template to create a budget sheet that works for you.